This time we check out the playing style of someone Jeff Beck once referred to as the greatest guitarist ever – Django Reinhardt. There’s nothing too taxing here except for all the position shifts. As usual, play through the piece very slowly until you can perform it without having to think too much. One of the students asked me to explain the theories and techniques behind gypsy jazz-guitar playing and also how to go about writing and playing in that style. I thought about it for a bit and came up with this little dittie inspired by old recordings that I’d heard of the gypsy genius Django Reinhardt. Before we start, though, I think a little background information would be prudent as there are probably some of you out there who haven’t heard of the late Jean-Baptiste Reinhardt. Django was born on the 23rd January 1910 in Liverchies, Belgium, to a family of wandering gypsies. From the age of 12 he started to play the violin (an instrument that his father played), banjo, and the guitar. It seems that right from the beginning he displayed an amazing natural gift for music. Unfortunately, in November 1928 fate provided an almost fatal blow when some paper flowers that Django’s mother had been making in their caravan caught alight. Django was caught in the ensuing fire and very severely burnt. He spent a year recovering from the accident but so bad were his injuries that two of the fingers on his left hand (the third and fourth) remained paralysed. Most people would have quit playing after such a devastating setback, but Django’s indomitable spirit refused to be beaten and instead he worked even harder on his instrument, going on to become one of the greatest guitar players ever and the man who single-handedly brought jazz into the gypsy culture. Many people think that his best work was with Quintette Du Hot Club De France, a group he formed in 1934 which featured his brother Joseph on guitar as well as a certain young violinist named Stephane Grappelli. With the onset of World War II, the group disbanded and Django went on to play with a variety of people, most notably Duke Ellington and his band. Such was his carefree attitude to life and his complete disregard for schedules that he turned up for their American tour without an instrument, convinced that someone would provide him with one! He died in 1953 and was buried in Samois sur Seine, where every year for one weekend in June a festival is held (Festival de Samois) to celebrate the life and music of the great Django Reinhardt. 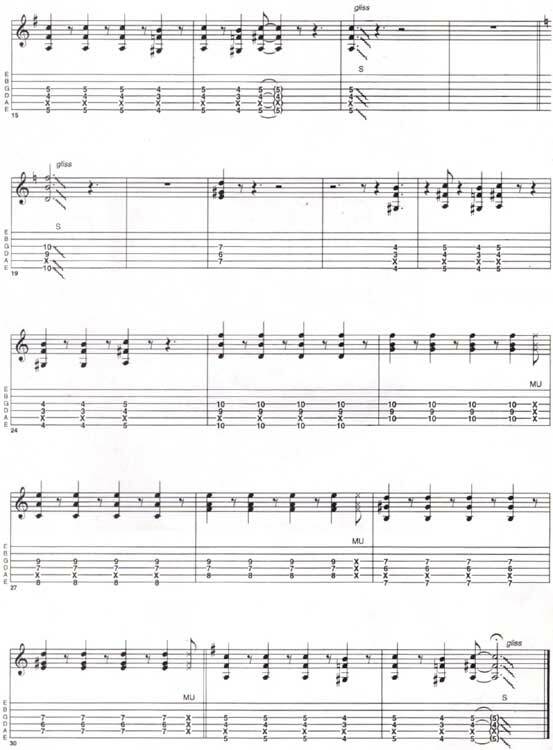 Now that you’ve got some background info let’s take a look at the piece which, at First glance, may look complicated, but in fact contains only four different chord shapes ,so it shouldn’t be too long before you’re flying through it. Picture 1 shows the first basic chord shape. The trick here is to mute the A string with the underneath of the second finger by playing quite flat in relation to the fingerboard. Also, the top two strings should be muted by the underneath of the first finger. Because of his disabilities, Django had to invent new chord shapes, and as a lot of them would contain only three or four notes they could have a number of different harmonic uses. For example, this chord shape, when played around the fifth fret, could be considered an Am6, a D9 (no root), an F major (1st inversion), an A diminished and so on. The second chord shape starts in bar three and is shown in Picture 1. This looks pretty similar to the first one except that the little finger has replaced the third finger on the G string. The first nine bars are performed just using these two chord shapes, so you may want to work on this section first. The next two chords are very similar to our first two except that the lowest note is now found on the A string. Shape three, then, is shown in Picture 3, and shape four is shown in Picture 4. Notice how my left-hand thumb hooks over the top of the neck to rest against (but not fret) the low E string in order to prevent it from ringing if I accidentally hit it. It’s almost impossible to miss the low E all the time, but it doesn’t matter as the extra percussive thump adds to the heavy rhythmic feel of the piece. 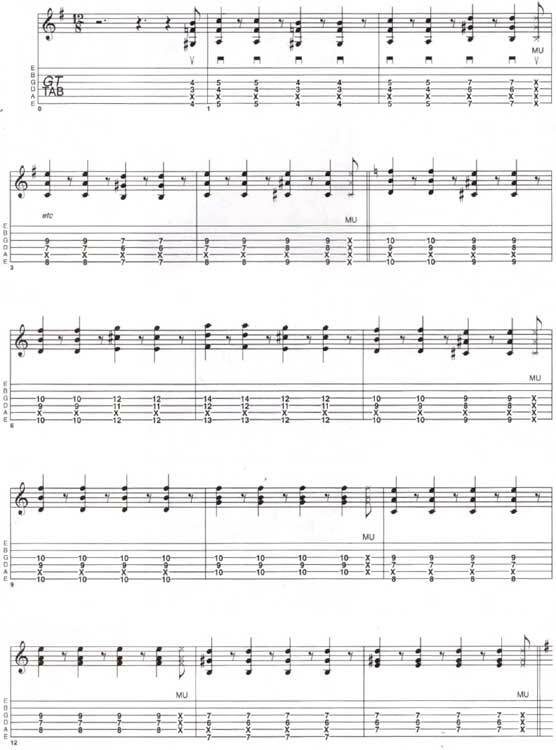 You’ll notice that the majority of the tune is performed using downstrokes, with the upstrokes adding an occasional pick-up into the next bar. These are usually (but not always) found at the end of every other bar. Also, to keep the rhythm tight and punchy try releasing your grip on the strings instantly after every hit. Obviously, this presents a small co-ordination problem but you’ll find the extra effort worthwhile. Finally, as the chords are moving fairly quickly I find it useful to concentrate on just one finger, in this case my second finger as it plays the lowest note in all the chord shapes. Hopefully all these little tips will help. Take your time with the piece and, above all, have fun with it. Django, of course! There are various others who play in this style (including his sons Lousson and Babik) but try to listen to Birelli Lagrene for some very cool things. The Basics. Kick off with this chord shape. Into bar three. Rearrange your digits to fret this chord. Thumbs up. Dampen the low E to prevent it sounding. Change again. Keep the thumb in place during the next chord. It’s a part of Jazz Guitar Style Lesson. Soleil De Samois. © 2012 - 2019 TabsClub Powered by TabsClub 42 queries in 0.266 seconds.